025b – Who Framed Roger Rabbit (Part Two) | All Eighties Movies. All The Time! This week while Gidgit works on her tan in Hawaii, we bring you the second half of our tour of Toon Town and find out exactly who Framed Roger Rabbit! 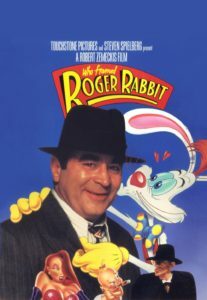 I thoughly enjoyed your #WhoFramedRogerRabbit (Parts One & Two) podcasts. Your combined knowledge and enthusiasm for this film and others is infectious. Recommend listening. PS:Gidgit I love #RomancingTheStone too (and let’s forget it’s sequel). I love this movie so much could not resist showing it to show it to my children. They did not get a lot of the references but that did not matter as we all enjoyed it. Listened to your podcast in the car taking them to and from school. My kids loved it. Said you are both very funny. I’ve now put them onto The Dark Crystal and Labyrinth thanks to you two. They are true fans. And thank you for not swearing. Not many movie podcasts I would let them listen to. Hi Barney, thanks for taking the time to write! We love seeing people enjoy these films, especially when they show their kids as well. We’ll be doing more kids movies in the future also! Slowly catching up with your podcasts. So glad you paid credit to this film with 2 podcasts. My kids adore this movie and my eldest daughter listened to your podcast on our way to vacation on her phone. So from a 11 year old here is what she said “they are total fun. Can I watch that movie again dad?” Thank you Angry and Gidgit. hey thats awesome! thanks so much for letting us know. we’re doing nightmare on elm street next, but will give you and your daughter a shoutout at the end if you want her to hear that bit. Thanks bob!